Researchers have developed a new strategy for directly detecting dark matter, the elusive material thought to account for the majority of matter in the universe. The strategy, which is designed to detect interactions between dark matter particles and a tub of superfluid helium, would be sensitive to particles in a much lower mass range than is possible with any of the large-scale experiments run so far, the researchers say. “Most of the large-scale dark matter searches so far have been looking for particles with a mass somewhere between 10 and 10,000 times the mass of a proton,” says coauthor Derek Stein, a physicist at Brown University. “Below 10 proton masses, these experiments start to lose their sensitivity. What we want to do is extend sensitivity down in mass by three or four orders of magnitude and explore the possibility of dark matter particles that are much lighter,” Stein says. There’s been good reason, Stein says, to search in the mass range where most dark matter experiments have focused thus far. A particle in that mass range would tie up a lot of loose theoretical ends. For example, the theory of supersymmetry—the idea that all the common particles we know and love have hidden partner particles—predicts dark matter candidates of the order of hundreds of proton masses. The detection strategy that the researchers have come up with involves a tub of superfluid helium. The idea is that dark matter particles passing through the tub should, on very rare occasions, smack into the nucleus of a helium atom. That collision would produce phonons and rotons—tiny excitations roughly similar to sound waves—which propagate with no loss of kinetic energy inside the superfluid. When those excitations reach the surface of the fluid, they’ll cause helium atoms to be released into a vacuum space above the surface. The detection of those atoms would be the signal that a dark matter interaction has taken place in the tub. “The last bit is the tricky part,” says coauthor Humphrey Maris, who has worked on similar helium-based detection schemes for other particles like solar neutrinos. The collision of a low-mass dark matter particle might result in only a single atom being released from the surface. That single atom would carry only about one milli-electron volt of energy, making it virtually impossible to detect through any traditional means. The novelty of this new detection scheme is a means to amplify that tiny, single-atom energy signature. Can fast radio bursts root out dark matter? It works by generating an electric field in the vacuum space above the liquid using an array of small, positively charged metal pins. As an atom released from the helium surface draws close to a pin, the positively charged tip will steal an electron from it, creating a positively charged helium ion. That newly created positive ion would be in close proximity to the positively charged pin, and because like charges repel each other, the ion will fly off with enough energy to be easily detectable by a standard calorimeter, a device that detects a temperature change when a particle runs into it. For a collision to be detectable, the incoming particle and the target atomic nuclei must be of compatible mass. If the incoming particle is much smaller in mass than the target nuclei, any collision would result in the particle simply bouncing off without leaving a trace. Since LUX and L-Z are intended for the detection of particles with mass greater than five times that of a proton, they used xenon, which has a nucleus of around 100 proton masses. 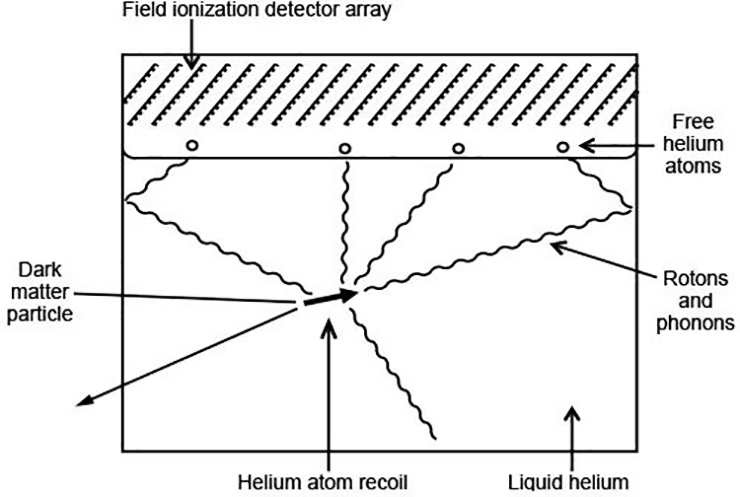 Helium has a nuclear mass only four times that of a proton, making a more compatible target for particles with much less mass. Even more important than the light target, the researchers say, is the ability of the new scheme to detect only a single atom evaporated from the helium surface. That kind of sensitivity would enable the device to detect the tiny amounts of energy deposited in the detector by particles with very small masses. The research team thinks its device would be sensitive to masses down to about twice the mass of an electron, roughly 1,000 to 10,000 times lighter than the particles detectable in large-scale dark matter experiments so far. The paper describing the new detector strategy appears in Physical Review Letters. The National Science Foundation funded the research in part.